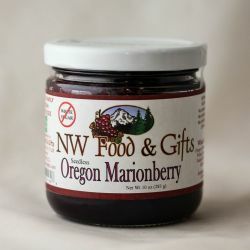 NW Food and Gifts Oregon Huckleberry Sugar-Free Jam. After tasting our Oregon Huckleberry Jam you will pick up the jar and loving say “ I’ll be your Huckleberry”. No other flavor can do the task of delivering such divine sweetness. All this goodness is made without added sugar and it is naturally sweetened with fruit juices. Spread on a hot biscuit, a buttery croissant or make Old Fashioned Huckleberry Jam Thumbprint cookies. Delicious heirloom jam recipe made with berries sourced only from local Oregon processors. Seedless and smooth consistency. Only the finest, freshest ingredients are used. All-natural, no GMOs, no preservatives, no artificial colors.